Who's ready for a cheap Windows Phone 8 thrill? You're not going to buy the Huawei Ascend W1 for power, you're going to buy it for practicality and value for money. When you consider the Huawei Ascend W1 will set you back just £120 it's difficult to fault, as you're getting a pretty good deal. 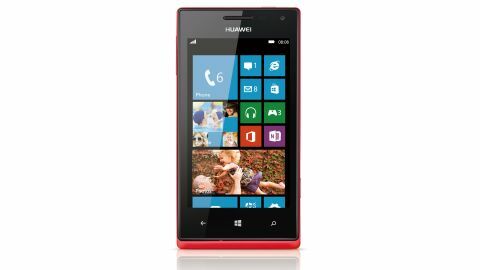 After more leaks than a wicker canoe, the Huawei Ascend W1 was finally unveiled at CES 2013 as the Chinese firm's first Windows Phone 8 smartphone. Aimed at the bottom end of the market, the Ascend W1 doesn't sport the premium polycarbonate unibody of the Nokia Lumia 920 or the sultry design of the HTC 8X, as it looks instead to rub shoulders with the Lumia 520 and various Android handsets such as the Ascend G330, Orange San Diego and ZTE Blade 3. With its rivals in mind you won't be surprised when we tell you the Ascend W1 will set you back £119.99 on PAYG, or £13.50 per month on contract. O2 currently has an exclusive deal to range the handset, although we're told Huawei is in talks with other carriers about selling the W1. You can pick the Ascend W1 up in a fetching shade of Electric Blue or Electric Pink. It also comes in black (as our review model did) and white, but it's not clear if the dark hue will be making its way to shop floors. The first thing you'll notice is instead of the glass fitting snugly into the body of the phone, on the Ascend W1 there's a noticeable ridge running all the way around the handset, giving the impression that it's just been slapped on top - reminiscent of the HTC One V.
There's a noticeable lip below the screen where the coloured plastic rear protrudes slightly, and it's not a look we're particularly keen on - although it does give you a flash of blue or pink from front on if you've chosen one of those colour options. The Ascend W1 does feel a bit bezel-heavy especially below the display, with the three navigation keys housed in a sea of black coupled with the chassis peeking out below. This adds extra length to the W1, but it's not too much hassle in terms of the size as the W1 measures a manageable 124.5 x 63.7mm. At 120g the Ascend W1 is a good weight for a 4-inch smartphone, and while the handset measures 10.1mm in depth, the slightly curved polycarbonate back rests nicely in the hand and provides some grip. The all-plastic construction is hardly a surprise considering the price, but the Ascend W1 does at least feel sturdy and capable of taking a few knocks. There's an easy to reach power/lock key on the top of the handset, sitting alongside a headphone jack, while on the left there's an equally well positioned volume rocker switch. On the right you'll find a dedicated camera key towards the base of the W1 - a requirement for any handset running the Windows Phone platform. The microUSB slot on the bottom of the device is aligned to the right side instead of the traditional middle and while this makes absolutely no difference when it comes to using the Ascend W1, it did get us wondering why Huawei had positioned it to one side. Answers on a postcard, please. Nip round the back and you can expect a dose of deja vu, as the design of the 5MP camera lens and single LED flash is almost identical to that of the HTC One X. Towards the bottom of the Ascend W1 there's the Windows Phone logo sitting above an elongated speaker grill, which we found kicked out a decent volume - although audio quality wasn't the greatest. A bonus here is the fact you can peel off the rear cover of the W1 to gain access to the 1,950mAh removable battery as well as the microSIM and microSD ports. Slightly frustratingly, you need to remove the battery to access both of these slots, so you won't be able to quickly swap SD cards as you please.